Focusrite OCTOPRE MKII 8-Channel Microphone Preamp. Condition: AN OPEN BOX ITEM. With eight channels of Focusrite preamplification and a built-in 24-bit / 96 kHz ADAT output, OctoPre MkII is Focusrite's powerful input upgrade for your Pro Tools system, or any digital audio workstation. It's also a great expansion for any analogue or digital console, or hard disk recorder. The digital output allows you to make the most of often-neglected ADAT inputs; ideal for expanding the number of mic pre inputs on your interface. Connect OctoPre MkII to your audio interface's ADAT input to create a high quality, multi-channel recording solution, ideal for tracking drums, as well guitars, keyboards, vocals and more. Eight high-quality award-winning Focusrite preamps. Built-in eight channel 24-bit / 96 kHz digital output. Make the most of your interface's ADAT input. 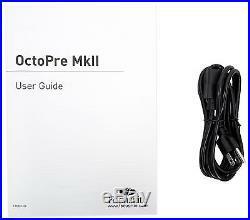 OctoPre MkII connects via its built-in Lightpipe output, with a'real world' dynamic range performance of 110dB. Mic preamps optimised for tracking drums. OctoPre MkII is designed not to clip, with preamps optimised to handle extreme levels from sound sources like kick drum and snare. Two quality Hi-Z instrument inputs. OctoPre MkII's first two channels feature DI's, ready for you to plug in your guitars and bass, instantly accessible on the front fascia. OctoPre MkII's fast-acting 5-LED input meters provide clear reference of input levels, helping you to avoid analogue or digital clipping. OctoPre MkII is drum-ready, with 10dB pads to stop hot signals from overdriving the microphone preamp. Direct outputs on every channel. For routing and flexibility, especially in the live environment, each mic pre can be routed to the mixer's analogue channels, with two mirrored ADAT outputs (44.1) left free to send to digital recorders. 48V Phantom power available on every channel. Switched in two groups (1-4 and 5-8) every channel is capable of supplying phantom power, for use with most condenser microphones. 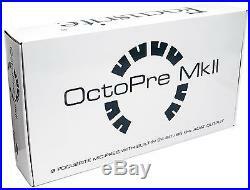 OctoPre MkII's internal clock delivers a jitter performance of < 10 PPM. For external clocks, a BNC connector is provided and industry-standard JetPLLT jitter elimination technology is employed. Frequency Response: 20Hz - 20kHz +/- 0.1 dB. THD+N: 0.001% (measured at 1kHz with a 20Hz/22kHz bandpass filter). Noise: EIN > 125dB (128dB analogue to digital): measured at 60dB of gain with 150 Ohm termination (20Hz/22kHz bandpass filter). Mic Gain: +10dB to + 55 dB. Phantom power switched in 2 x 4 channel groups (1-4 and 5-8). Maximum input level: +8 dBu (+17 dBu with pad on input). Frequency Response: 20Hz - 20kHz +/- 0.1dB. THD+N: < 0.001% (measured with 0dBFS input and 22Hz/22kHz bandpass filter). Noise: -90dBu (22Hz/22kHz bandpass filter). Line 1-8 Gain: -10 dB to +36 dB. Line maximum input level: +22 dBu. THD+N: 0.004% (measured with 0dBu input and 20Hz/22kHz bandpass filter). Noise: -87dBu (20Hz/22kHz bandpass filter). Instrument Gain: +10 dB to +55 dB. Maximum input level: +8 dBu. Frequency Response: 20Hz - 20kHz +/- 0.2dB. THD+N < 0.0010% (-100dB) (measured with 0dBFS input 22Hz/22kHz bandpass filter, un-weighted). A/D Dynamic Range 110dB'A-weighted' (all inputs). JetPLLT Technology providing superb jitter reduction for class leading converter performance. Clock Jitter < 250 pico seconds. Sample Rate Clock Accuracy: +/- 20PPM. Sample rates: 44.1kHz to 96kHz. Clock Sources: Internal and Word Clock. Weight: 3.6 kg / 7.93 lbs. Dimensions: W = 484mm / 19", H = 45mm / 1.8", D = 265mm / 10.4. 2x Mic / Line / Instrument inputs on the front panel (Instrument selected via front panel button). 6x Mic / Line inputs on the rear panel. Switches automatically between Mic (XLR) and Line (TRS). 8x Balanced 1/4 TRS Jack on the rear panel. 2x ADAT Lightpipe (TOSLINK) outputs. Provides 8 channels per port (16 total) at 44.1 and 48kHz. Provide 4 channels per port (8 total) at 88.2 and 96kHz (S-MUX). Note that when running at 44.1 or 48kHz, the digital outputs are mirrored, providing outputs 1 - 8 on both ports. 8x Five segment input LED meters (-42, -18, -6, -3 and 0dBFS). 4x Sample Rate LED's (44.1k, 48k, 88.2k and 96k). 2x Sync Source LED's (Internal and Word Clock). Best prices - We sell all Focusrite Products at wholesale price. Detailed information of all products. Lifetime Customer Service by Focusrite product Expert. Guaranteed legitimate and authentic merchandise. Defective items: If your item is defective within the first 30 days of when it was delivered to you; you have the following options. We will send you a. To replace the item for a brand new one. Non-defective items: If you want to return your item within the first 30 days of when it was delivered to you; you have the following options. This includes blown speakers with burned voice coils. The item "Focusrite OCTOPRE MKII 8 Channel Microphone Mic Preamp OCTO PRE MK II" is in sale since Monday, March 07, 2016. This item is in the category "Musical Instruments & Gear\Pro Audio Equipment\Preamps & Channel Strips". The seller is "audiosavings" and is located in Inwood, New York. This item can be shipped to United States, to Canada, to United Kingdom, to China, to Mexico, to Germany, to Japan, BR, to France, to Australia, RU, DK, RO, SK, BG, CZ, FI, HU, LV, LT, MT, EE, GR, PT, CY, SI, SE, KR, ID, to Taiwan, TH, to Belgium, to Hong Kong, to Ireland, to Netherlands, PL, to Spain, to Italy, to Austria, IL, to New Zealand, PH, SG, to Switzerland, NO, SA, UA, AE, QA, KW, BH, HR, MY, CL, CO, CR, PA, TT.